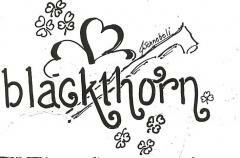 Welcome to Blackthorn Fox Terriers. 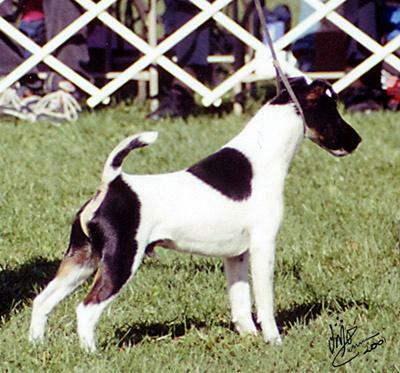 We are a very small kennel breeding Smooth Fox Terriers for show, companion,and the performance events. The most important things in our breeding program are the health of the animals, the temperaments, and the soundness. We breed to continue the long tradition set down by the original English framers of our breed standard and believe in moderation above all. We breed very sparingly, and strive to place our dogs in the best homes, with owners who meet our high standards. We occasionally have puppies or adults available. Here you will have a chance to see our dogs from years past and our current houligans, as well as the puppies who are our future. Blackthorn is located in Williamsburg, Virginia and our dogs are frequently seen walking the historic streets of Colonial Williamsburg to the delight of visitors and locals. The dogs love the horse-drawn carriages, the sheep and cattle grazing the pastures, and most importantly, the admiring looks and friendly pats from people from all over the world. Our newest special at Blackthorn - Ch Buchanan Belladonna Blackthorn! 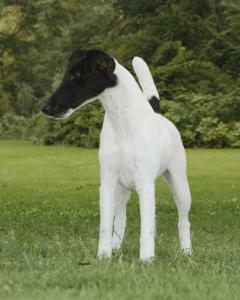 Bebe was bred by Donna Knipes, and is sired by Ch Blackthorn The Butler Did It x Ch Rpaidan Wild indigo. She is co-owned with Don and Vicki Barnes. Bebe was Best in Sweeps at the AFTC National in Louisville in March, finishing that weekend by going Best of Winners under Peter Green. Bebe's next shows were at Great Western in June, where she was BOS at the AFTC National under Tommy Yates. Watch for her this fall!